Functional fitness training is a practical approach to creating the strength and balance you need to thrive in the real world. Exercise should make you feel good and look good—and also make it easier for you to perform daily activities. In a typical day we use our bodies in many ways, from walking to climbing, bending to twisting, lifting to pulling. But lifting a stable barbell isn’t the same as picking up a child or a bag of heavy dog food. Enter functional fitness training. Functional fitness training focuses on exercises that mimic daily movement, such as getting in and out of a car, picking up grocery bags or twisting to reach something. Functional fitness exercises use more muscles simultaneously and encompass all three planes of motion: Sagittal (front to back), frontal (side to side) and transverse (rotating). There is also a greater emphasis on stability and strengthening the core. As well, functional fitness training takes in all seven movement patterns: Squat, lunge, push, pull, bend, twist and gait. Exercises are done with body weight and can be made more difficult by adding resistance bands, dumbbells, barbells, kettlebells and more. Much of traditional strength training emphasizes individual muscle groups and is primarily done in the saggital plane. It is often performed in a seated or supported position, such as when using gym machines, resulting in less core engagement and no need to balance. The muscles are isolated in a stabilized and controlled environment. However, the environment in real life is much less stable and controlled, with uneven surfaces, items that shift and move, and unbalanced weight in each arm. Here are five exercises to help build a stronger body for everyday activities. Try three sets of 10-12 reps each. Stand with feet hip-width apart. Step your left foot behind your right at a 45° angle. Come back to centre, then step right foot behind left. Keep chest upright and core engaged. Continue, alternating sides. Stand with feet wider than hip-width apart with dumbbells in hands at shoulder height. Push hips back and down. Lower until thighs are parallel to the floor. Keep knees behind toes with weight in the heels. As you return to standing, squeeze glutes and press the dumbbells up while rotating your torso to one side. Repeat, rotating to the other side when you rise. Stand with feet hip-width apart. 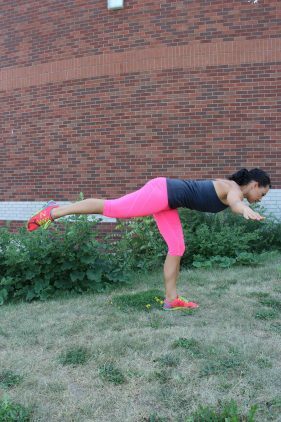 Transfer weight to one leg and tip forward from the hip, extending the other leg back and arms out to the side. Keep back straight and get as parallel to the floor as possible. Return to the start position and repeat. Place hands on the ground shoulder-width apart with shoulders above wrists. Bending the elbows, lower your chest toward the ground. Push up and lift one arm up towards the ceiling while twisting your torso to the side. Roll onto the sides of your feet and keep your body straight. Return to the starting position. Repeat, raising the opposite arm. Stand with feet hip-width apart, holding a dumbbell in one hand. Lean forward from the hips and lift opposite leg. Hang the dumbbell in front of your body with a neutral grip. Keeping shoulders down and back flat, contract your back and row the dumbbell toward your ribcage. Lower your arm to starting position. Repeat all reps on one side, then the other. Lydia Di Francesco, CPT, is the founder of the 15 Minute Workout Club, helping women get strong and fit through short, effective online workouts. www.15minuteworkoutclub.com. This article originally appeared in OptiMYz 905. The basics of fitness: cardio, warm-up, cool down, stretching, and weight training. For best results, print this and take it to the gym.